It's common for a sighted person to wonder what blind people see or for a blind person to wonder whether the experience is the same for others without sight. There is no single answer to the question, "What do blind people see?" because there are different degrees of blindness. Also, since it's the brain that "sees" information, it matters whether a person ever had sight. Blind From Birth: A person who has never had sight doesn't see. 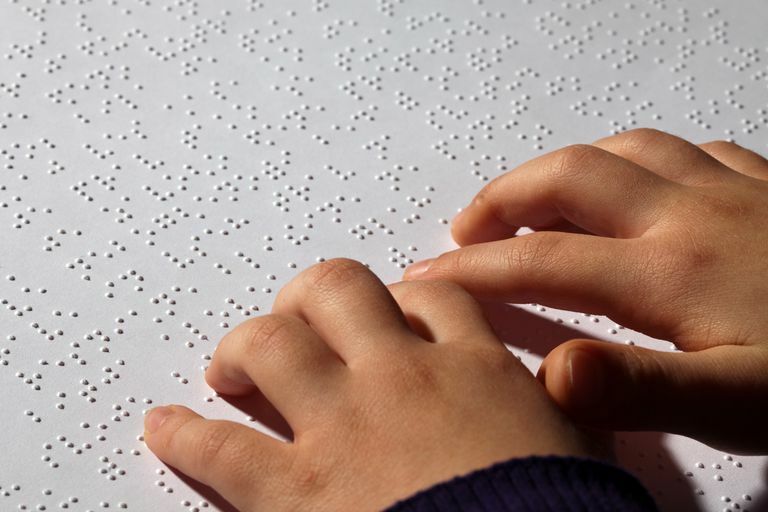 Samuel, who was born blind, tells ThoughtCo that saying that a blind person sees black is incorrect because that person often has no other sensation of sight to compare against. "It's just nothingness," he says. For a sighted person, it can be helpful to think of it like this: Close one eye and use the open eye to focus on something. What does the closed eye see? Nothing. Another analogy is to compare a blind person's sight to what you see with your elbow. Went Totally Blind: People who have lost their sight have different experiences. Some describe seeing complete darkness, like being in a cave. Some people see sparks or experience vivid visual hallucinations that may take the form of recognizable shapes, random shapes and colors, or flashes of light. The "visions" are a hallmark of Charles Bonnet syndrome (CBS). CBS may be lasting or transient in nature. It is not a mental illness and is not associated with brain damage. Legally Blind: A person may be able to see large objects and people, but they are out of focus. A legally blind person may see colors or see in focus at a certain distance (e.g., be able to count fingers in front of the face). In other cases, color acuity may be lost or all vision is hazy. The experience is highly variable. Joey, who has 20/400 vision, tells ThoughtCo that he " constantly sees neon speckles that are always moving and changing colors." Light Perception: A person who still has light perception can't form clear images, but can tell when the lights are on or off. Tunnel Vision: Vision may be relatively normal (or not), but only within a certain radius. A person with tunnel vision can't see objects except within a cone of less than 10 degrees. A person who is born blind has dreams, but doesn't see images. Dreams could include sounds, tactile information, odors, flavors, and feelings. On the other hand, if a person has sight and then loses it, dreams may include images. People who have impaired vision (legally blind) do see in their dreams. The appearance of objects in dreams depends on the type and history of blindness. Mostly, the vision in dreams is comparable to the range of vision the person has had throughout life. For example, someone who has color blindness won't suddenly see new colors while dreaming. A person whose vision degraded over time might dream with the perfect clarity of earlier days or might dream at present acuity. Sighted people who wear corrective lenses have much the same experience. A dream may be perfectly in focus or not. It's all based on experience gathered over time. Someone who is blind yet perceives flashes of light and color from Charles Bonnet syndrome may incorporate these experiences into dreams. Curiously, the rapid eye movement that characterizes REM sleep occurs in some blind people, even if they do not see images in dreams. Cases in which rapid eye movement does not occur are more likely when a person has been blind either since birth or else lost sight at a very young age. Although it's not the type of vision that produces images, it's possible some people who are totally blind perceive light non-visually. The evidence started with a 1923 research project conducted by Harvard graduate student Clyde Keeler. Keeler bred mice that had a mutation in which their eyes lacked retinal photoreceptors. Although the mice lacked the rods and cones needed for vision, their pupils reacted to light and they maintained circadian rhythms set by day-night cycles. Eighty years later, scientists discovered special cells called intrinsically photosensitive retinal ganglion cells (ipRGCs) in mouse and human eyes. The ipRGCs are found on the nerves that conduct signals from the retina to the brain rather than on the retina itself. The cells detect light while not contributing to vision. Thus, if a person has at least one eye that can receive light (sighted or not), he or she can theoretically sense light and dark. J. Alan Hobson, Edward F. Pace-Scott, & Robert Stickgold (2000), “Dreaming and the brain: Toward a cognitive neuroscience of conscious states”, Behavioral and Brain Sciences 23. Schultz, G; Melzack, R (1991). "The Charles Bonnet syndrome: 'phantom visual images'". Perception. 20 (6): 809–25.